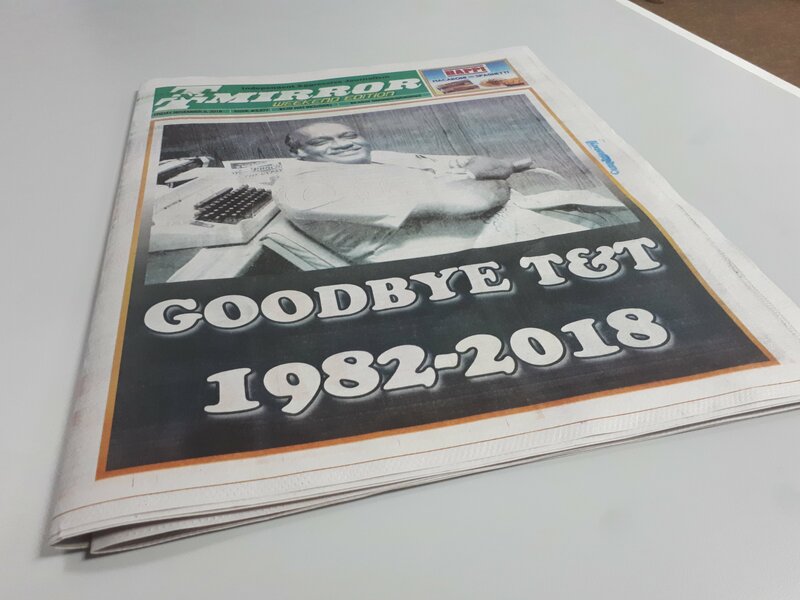 After 36 years of publication, the bi-weekly TnT Mirror newspaper is closing its doors. The paper put out its final issue, a weekend edition, Thursday. "The death of a newspaper is a very sad thing," wrote former editor Jeff Hackett. He wrote of the closure of the Daily Mirror on September 2, 1966, and the founding of the TnT Mirror by Patrick Chookolingo in 1982. Dawn Ford, Chookolingo's daughter, said the paper was closed due to economic circumstances and the cost of newsprint. Errol Pilgrim, in a Mirror column headlined Goodbye T&T, wrote, "Today, we see goodbye to TT in this our final issue of the Mirror and express our sincere thanks and deep gratitude to those of you in the national community who identified with the challenging commitment of this newspaper to stimulate your thoughts and inform your opinions purely in the national interest." The final issue also features articles by editor Irene Medina on "Choko, godfather of weekly journalism" and reporters such as Yvonne Baboolal and Denyse Renne, as well as flashback photos. Reply to "TnT Mirror closes after 36 years"